Appears on Bryant's map of 1826. Thomas Aldridge Sturley advised 25th October 1834 that having taken the Inn, he had spared no expense to render every accommodation necessary. Great attention having been paid for the comfort of Commercial Gentlemen, having provided choice Wines and Liquors, good Beds, Neat Post Chaises and Horses, and reasonable Terms. N. B. Good Hay for the accommodation of Bullocks. Henry Jolly, Dealer in Horses, announced 17th October 1840 that he had taken the Inn and that Considerable Alterations were then being made to the Stabling to allow very superior accommodation to Gentlemen in the habit of Hunting with the Norfolk Fox and other Hounds. In 1841, Henry Jolly is given as a Publican, living at Mill Road. The Trustees of the Norwich to Fakenham Turnpike met here 9th August 1841 in order to Let by Auction for periods of two years, the Gates at Drayton, Bawdeswell (with Sparham Gate annexed), and the Langor Bridge Gate. The Bawdeswell / Sparham Gates produced returns of £244 in the previous year. 3 months advance rent was to be immediately paid by the highest bidder. 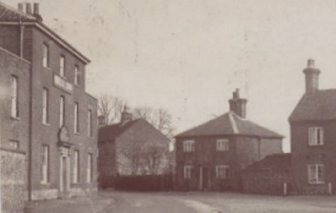 John Bush, for many years Ostler at the Inn, advised his Friends and Commercial Gentlemen that he had taken the premises - 29th November 1845. Property described as Freehold, owned by George Morse in S&P document covering the years 06.11.1837 to 11.1851. Advertised to let September 1860 including 20 Acres of Land. To Let October 1866 with 20 Acres of land. Apply Messrs. Steward, Patteson, Finch and Co. Offered To Let from Michaelmas 1895 along with 20 acres of Land. Advertised as `Near Foulsham Station'. Apply Messrs. Steward & Patteson. Commercial Hotel & Posting House. Watney Mann (East Anglia) Ltd. Ceased trading 04.02.1970 according to the Licence Registers. In January 1844 the Bankruptcy Petition of Thomas Aldridge Sturley, then of the Dereham Road, Bawdeswell, first a Beer Shop-keeper and Farmer, since out of business, before that of Bawdeswell, Innkeeper, Farmer and Licensed to Let Horses and Gigs for Hire, was published. His case to be heard on 3rd February 1844, in London. ** On 16th November 1847 Mr. Sturley had shot and wounded Samuel Page of Cawston, (his uncle). Accused of attempted murder, he was found guilty and sentenced to death at his trial Wednesday 29th March 1848 (Age then given as 39). In 1851 Mary is recorded as a Pauper with son and in 1861 as a former innkeeper with a 16 year old daughter. In 1851 Thomas Sturley survives in Portland District Convict Prison where his profession is is given as Publican / Licensed Victualler. By 1861 he appears to be living in Swaffham with his mother and is given as a retired farmer age 53. By 1871 Thomas and Mary are again resident in Bawdeswell Street. He is unemployed. They still abide in Bawdeswell Street in 1881 where he is given as a former innkeeper, age 73. Wife Mary is 68. Thomas died Q1 1883 and Mary during Q3 1888. ** Thanks 18/12/13 to John Annen, G G Grandnephew of Thomas Sturley for information on the attempted murder.